Otis Sistrunk a former defensive lineman for the Oakland Raiders turns seventy- two today. 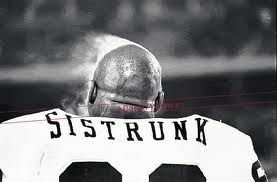 When I hear the name Otis Sistrunk I think of one thing- back on a Monday Night Football telecast- this was when Howard Cosell, Frank Gifford and former NFL great Alex Karras were in the booth- their was a shot of the 6’5 265 pound Sistrunk on the sidelines- and Karras suggested that Sistrunk was from the University of Mars. In the Raiders bio of Sistrunk it says US MARS- Sistrunk had went from high school to the US Marines- he was one of the few players who never played college football.